A novel about saving the environment through totalitarian repression—by Frank Herbert’s son Brian. A revolution has taken over the government of the United States, and the environment has been saved. All pollution has been banned and reversed. It’s a bright, green new world. But this new world comes at a great cost. The United States is ruled by a fascist green police state, and the corporations are fighting back. Joining them is an increasing number of rebels angered by the dictatorship of Chairman Rahma. The chairman’s power is absolute and appears strong, but cracks are beginning to show as new weapons are developed by the old corporate powers, foreign alliances begin to make inroads into America’s influence … and strange reports of mutants filter through the government’s censorship. 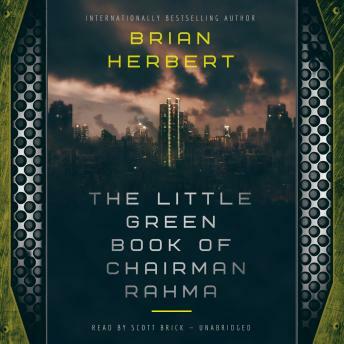 The Little Green Book of Chairman Rahma is both thrilling and thought-provoking, revealing that human greed can poison even the most righteous intentions.